The Church in Wales' governing body has narrowly rejected proposals to allow women priests to become bishops. The controversial bill was defeated by three votes at the 140-member body meeting in Lampeter, despite being backed by the Archbishop of Wales. Ahead of the vote, Dr Barry Morgan had urged backing for the bill saying he could not see how women could logically be excluded from becoming bishops. Afterwards the church leader spoke of his "great disappointment". "I feel we won the argument, but we narrowly lost the vote," he said. "I think it is three years before this can be brought forward again and the issue will certainly not be going away." More than 100 clergy warned in December last year they would not accept the ministry of women bishops. 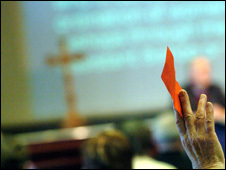 The bill, proposed by six diocesan bishops, needed a two-thirds majority in each section of the governing body to take effect. Voting was split into three separate sections, the House of Laity, the House of Clerics and the House of Bishops. The House of Clerics voted 27 to 18 in favour but, with abstentions, missed the required two-thirds majority. The other houses attained the required minimum. Its defeat leaves Wales and England as the only UK regions in the Anglican Church that do not allow women bishops. The Anglican Church in Scotland, Ireland, New Zealand, Canada and the United States already allows women to be ordained as bishops. Women have been ordained as priests within the Church in Wales since January 1997. There are now 160 women in that role out of a total of 696 clerics in the church. 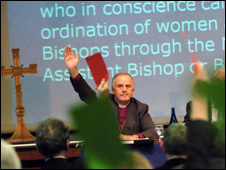 An amendment for the bill to provide a male bishop for those opposed to the ordination of women bishops was also voted down. Dr Morgan said he was pleased the amendment was also defeated as he said it would have changed the constitutional nature of the church by requiring bishops to appoint an assistant bishop. In a statement, he said: "It is likely the bill would have sailed through if the amendment had been passed but that would have meant us, as supporters, compromising our principles, which we were not prepared to do. "Like this bill, the bill to ordain women to the priesthood was initially defeated, but it came back to the governing body and was passed 11 years ago. "This is not the end for this bill either - it will not go away and it will not be ignored, it is something the Church in Wales will have to grapple with. "But it saddens me that we will have to go through the whole process and all the work involved once again." One of those opposed to the bill, Reverend Jeremy Winston, vicar of St Mary's Priory Church, Abergavenny, said he expected the issue to return. He said the bill might have gone through if the proposed amendment had been passed for more "traditionalist" members of the church. He said: "It [the amendment] was very much a way in that those who are very devout and committed members of the Church in Wales but are not in agreement on this issue [women bishops], could continue to play a full active and devout, prayerful, part in the life of the Church in Wales, which we want to do." Listen to Canon Mary Stallard and Reverend Roy Doxsey discuss women bishops.